Сервисом alaTest было собрано и проанализировано 4 обзора для Origin PC Chronos. Средняя оценка этого товара 4.1/5, в сравнении со средней оценкой 4.1/5 для других Настольные компьютеры. Обозревателям нравится размер Origin PC Chronos. Мы проанализировали оценки экспертов и пользователей, дату выпуска продукта и другие факторы. По сравнению с другими товарами из категории Настольные компьютеры, Origin PC Chronos получил alaScore™ 92/100 = Отличное качество! Oculus and Vive VR setups will take up a lot of space, but this small desktop won't. 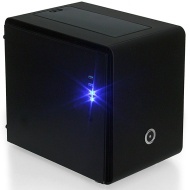 The Origin PC Chronos packs a lot of power into a small, well-designed case. This is one of the most space-efficient ways to get a VR-ready PC, and the company is known for excellent service and support. With high-power components in a small case, the fans can get loud. The expensive configuration tested here has an Nvidia 970 graphics card -- upgrading to the top of the line will cost extra. One of the most premium-feeling (and premium-priced) of the first generation of VR-ready gaming desktops, the Origin PC Chronos is compact but powerful. Origin PC proves you can get two GeForce GTX 780 Tis and a heavily overclocked Core i7-4770K into a microATX form factor using BitFenix's popular Phenom M chassis. Yes, the combination is expensive, but it's also oh-so fast. We deconstruct it for you.